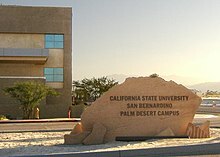 In the 2011–12 academic year, CSU awarded 52 percent of newly issued California teaching credentials, 47 percent of the state's engineering degrees, 28 percent of the state's information technology bachelor's degrees, and it had more graduates in business (50 percent), agriculture (72 percent), communication studies, health (53 percent), education, and public administration (52 percent) than all other universities and colleges in California combined. Altogether, about half of the bachelor's degrees, one-third of the master's degrees, and nearly two percent of the doctoral degrees awarded annually in California are from the CSU. Furthermore, the CSU system is one of the top U.S. producers of graduates who move on to earn their Ph.D. degrees in a related field. The CSU has a total of 17 AACSB accredited graduate business schools which is over twice as many as any other collegiate system. Since 1961, nearly three million alumni have received their bachelor's, master's, or doctoral degrees from the CSU system. CSU offers more than 1,800 degree programs in some 240 subject areas. In fall of 2015, 9,282 (or 39 percent) of CSU's 24,405 faculty were tenured or on the tenure track. In 1887, the California State Legislature dropped the word "California" from the name of the San Jose and Los Angeles schools, renaming them "State Normal Schools." Later Chico (1887), San Diego (1897), and other schools became part of the State Normal School system. However, these did not form a system in the modern sense, in that each normal school had its own board of trustees and all were governed independently from one another. In 1919, the State Normal School at Los Angeles became the Southern Branch of the University of California; in 1927, it became the University of California at Los Angeles (the "at" was later replaced with a comma in 1958). In May 1921, the legislature enacted a comprehensive reform package for the state's educational system, which went into effect that July. 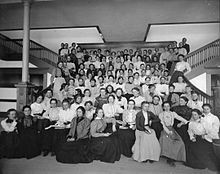 The State Normal Schools were renamed State Teachers Colleges, their boards of trustees were dissolved, and they were brought under the supervision of the Division of Normal and Special Schools of the new California Department of Education located at the state capital in Sacramento. This meant that they were to be managed from Sacramento by the deputy director of the division, who in turn was under the State Superintendent of Public Instruction (the ex officio director of the Department of Education) and the State Board of Education. By this time it was already commonplace to refer to most of the campuses with their city names plus the word "state" (e.g., "San Jose State," "San Diego State," "San Francisco State"). The resulting administrative situation from 1921 to 1960 was quite complicated. On the one hand, the Department of Education's actual supervision of the presidents of the State Teachers Colleges was minimal, which translated into substantial autonomy when it came to day-to-day operations. Unlike the University of California, the State Teachers Colleges had no academic senates through which their faculties could collectively express their displeasure with presidents' decisions. On the other hand, the State Teachers Colleges were treated under state law as ordinary state agencies, which meant their budgets were subject to the same stifling bureaucratic financial controls as all other state agencies (except the University of California). At least one president would depart his state college because of his express frustration over that issue: J. Paul Leonard, president of San Francisco State, in 1957. In 1932, the Carnegie Foundation for the Advancement of Teaching was asked by the state legislature and governor to perform a study of California higher education. The Foundation's 1933 report sharply criticized the State Teachers Colleges for their intrusion upon UC's liberal arts prerogative and recommended their transfer to the Regents of the University of California (who would be expected to put them back in their proper place). This recommendation spectacularly backfired when the faculties and administrations of the State Teachers Colleges rallied to protect their independence from the Regents. In 1935, the State Teachers Colleges were formally upgraded by the state legislature to State Colleges and were expressly authorized to offer a full four-year liberal arts curriculum, culminating in bachelor's degrees, but they remained under the Department of Education. During World War II, a group of local Santa Barbara leaders and business promoters (with the acquiescence of college administrators) were able to convince the state legislature and governor to transfer Santa Barbara State College to the University of California in 1944. After losing a second campus to UC, the state colleges' supporters arranged for the California state constitution to be amended in 1946 to prevent it from happening again. During this era, the state colleges' peculiar mix of centralization and decentralization began to look rather incongruous in comparison to the highly centralized University of California and the highly decentralized local school districts around the state which operated K–12 schools and community colleges, all of which enjoyed much more autonomy from the rest of the state government than the state colleges. In 1960, the California Master Plan for Higher Education and the resulting Donahoe Act granted similar autonomy to the state college system. The Donahoe Act authorized the appointment of a Board of Trustees to govern the CSU system, as well as a systemwide Chancellor. Today the campuses of the CSU system include comprehensive universities and polytechnic universities along with the only maritime academy in the western United States—one that receives aid from the U.S. Maritime Administration. Appointed trustees: Silas Abrego, Jane W. Carney, Adam Day (Chair), Rebecca D. Eisen, Douglas Faigin, Debra S. Farar, Jean P. Firstenberg, Wenda Fong, Lillian Kimbell (Vice-chair), Jack McGrory, Thelma Melendez de Santa Ana, Hugo M. Moralas, John Nilon, J. Lawrence Norton, Romey Sabalius, Lateefah Simon, Christopher Steinhauser, Peter J. Taylor. Student Trustees (also appointed): Emily F. Hinton (voting) and Juan Garcia (non-voting). The position of the Chancellor is declared by statute and is defined by resolutions of the BOT. The delegation of authority from the BOT to the Chancellor has historically been controlled by a BOT resolution titled "Statement of General Principles in the Delegation of Authority and Responsibility" of August 4, 1961, and is now controlled by the Standing Orders of the Board of Trustees of the California State University. The Chancellor is the chief executive officer, and all Presidents report directly to the Chancellor. The CSU produces 62% of the bachelor's degrees awarded in agriculture, 54% in business, 44% in health and medicine, 64% in hospitality and tourism, 45% in engineering, and 44% of those in media, culture and design. [clarification needed] The CSU is the state's largest source of educators, more than half of the state's newly credentialed teachers are from the CSU, expanding the state's rank of teachers by nearly 12,500 per year. During the recession years (December 2007 – June 2009), the CSU lost 1/3 of its revenue – roughly $1 billion – and 4,000 employees. With the state's reinvestment in higher education, the CSU is restoring its employee ranks and currently employs a record number of instructional faculty. Between 2010 and 2015, the number of CSU faculty increased by 3,500, but the number of tenure track faculty declined by 150, leaving the CSU system with its lowest percentage of tenure track faculty (39%) in the schools' history. In the two years (2013–14, 2014–15) through the state's reinvestment, the CSU has directed $129.6 million to enhance employee compensation. Another $65.5 million in slated in the 2015–16 operating budget for employee compensation. However, according to the California Faculty Association (CFA) report, "Race to the Bottom: CSU's 10-Year Failure to Fund Its Core Mission", written in 2015, "Over the past decade— in good times and bad, whether state funding was up or down, when tuition was raised and when it wasn’t— CSU expenditures on faculty salaries have remained essentially flat... When compared to other university systems around the country, and to every education segment in California, the CSU stands out for its unparalleled failure to improve faculty salaries or even to protect them from the ravages of inflation." * U.S. News & World Report ranks San Diego State, Fresno State, San Francisco State, and Cal State Fullerton in the National Universities category as they offer Ph.D programs. The other universities in the California State University system are ranked in the Regional Universities (West) category as they do not offer Ph.D programs. ^ Cal Maritime only awards undergraduate degrees and therefore is ranked separately from the other campuses of the California State University. It is ranked in the "Regional Colleges" category. Los Angeles State Normal School (State Normal School at Los Angeles), founded 1882, became the University of California at Los Angeles in 1919. Santa Barbara State College, founded 1909, became the University of California at Santa Barbara in 1944. Both California public university systems are publicly funded higher education institutions. Despite having fewer students, some individual UC campuses, as a result of their research emphasis and medical centers, have larger budgets than the entire CSU system. According to a 2002 study, faculty at the CSU spend about 30 hours a week teaching and advising students and about 10 hours a week on research/creative activities, while a 1984 study reports faculty at the UC spend about 26 hours a week teaching and advising students and about 23 hours a week on research/creative activities. CSU's Chancellor, Dr. Charles B. Reed, pointed out when delivering his Pullias Lecture at the University of Southern California, that California was big enough to afford two world-class systems of public higher education, one that supports research (UC) and one that supports teaching (CSU). However, student per capita spending is lower at CSU, and that, together with the lack of a research mission or independent doctoral programs under the California Master Plan, has led some in American higher education to develop the perception that the CSU system is less prestigious than the UC system. Kevin Starr, the seventh State Librarian of California, stated that the "University of California drew from the top ten percent of the state's high school graduates" while "the CSU system was expected to draw its students from the top 33 percent of each graduating high school class." However, per the California Master Plan, the UC draws from the top 12.5 percent of California's public high school graduates. For many of the CSU system's early formative years, the more powerful UC system was able to delay or prevent the CSU schools from gaining the right to grant certain types of degrees. At present, certain types of doctorates are the only degree types that CSU schools do not grant. Thus, while similar campuses in other states (e.g., Illinois State University) eventually grew into research-oriented state universities, the UC system's powerful research university monopoly has successfully prevented the CSU as a system from experiencing a similar development, although some individual CSU campuses have become more research-oriented. There are 23 CSU campuses and 10 UC campuses representing approximately 437,000 and 237,000 students respectively. The cost of CSU tuition is approximately half that of UC. Thus, the CSU system has been referred to by former California State University authorities as "The People's University." CSU and UC use the terms "president" and "chancellor" internally in opposite ways: At CSU, the campuses are headed by presidents who report to a systemwide chancellor; but at UC, they are headed by chancellors who report to a systemwide president. The majority of CSU campuses operate on the semester system while UC campuses operate on the quarter system (with the exception of UC Berkeley, UC Merced, the UCLA medical school, and all UC law schools). As of Fall 2014, the CSU began converting its six remaining quarter campuses to the semester calendar. Cal State LA and Cal State Bakersfield converted in Fall 2016, while Cal State East Bay and Cal Poly Pomona transitioned to semesters in Fall 2018. Cal State San Bernardino is planning to make the conversion in Fall 2020, while Cal Poly San Luis Obispo has not announced a date for conversion to semesters. Historically the requirements for admission to the CSU have been less stringent than the UC system. However, both systems require completion of the A-G requirements in high school as part of admission. The CSU attempts to accept applicants from the top one-third of California high school graduates. In contrast, the UC attempts to accept the top one-eighth. In an effort to maintain a 60/40 ratio of upper division students to lower division students and to encourage students to attend a California community college first, both university systems give priority to California community college transfer students. Furthermore, six California State University campuses are fully impacted for both freshmen and transfers, meaning in addition to admission into the school, admission into all majors is also impacted. The six campuses that are fully impacted are Fresno, Fullerton, Long Beach, San Diego, San Jose, and San Luis Obispo. The UC system follows a consistent style in the naming of campuses, using the words "University of California" followed by the name of its declared home city, with a comma as the separator. Most CSU campuses follow a similar pattern, though several are named only for their home city or county, such as San Francisco State University, San Jose State University, San Diego State University, or Sonoma State University. Some of the colleges follow neither pattern. California Polytechnic State University (in San Luis Obispo) and California State Polytechnic University, Pomona use the word "polytechnic" in both their full names (but in different word orders), and the official name of the San Luis Obispo institution does not include the name of its city. They also use the abbreviated forms "Cal Poly San Luis Obispo" and "Cal Poly Pomona" respectively, and the San Luis Obispo campus brands its athletic program as "Cal Poly" with no city. In addition, the California Maritime Academy (Cal Maritime) is the only campus whose official name does not refer to its location in California. 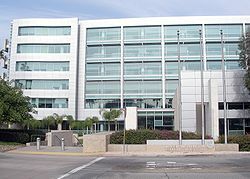 Both Channel Islands and San Marcos campuses' official names do not include a comma, unlike the typical style of the CSU naming convention, and instead follow California State University San Marcos, or Channel Islands. Some critics, including Donald Gerth (former President of Sacramento State), have claimed that the weak California State University identity has contributed to the CSU's perceived lack of prestige when compared to the University of California. An impacted campus or major is one which has more CSU-qualified students than capacity permits. As of 2012[update], 16 out of the 23 campuses are impacted including Chico, Fresno, Fullerton, Humboldt, Long Beach, Los Angeles, Northridge, Pomona, San Bernardino, Sacramento, San Diego, San Francisco, San Jose, Sonoma, San Marcos, and San Luis Obispo. Some programs at other campuses are similarly impacted. Despite this, CSU undergraduate admissions are quantitatively based and generally do not include items such as personal statements, SAT Subject Test scores, letters of recommendation, or portfolios. 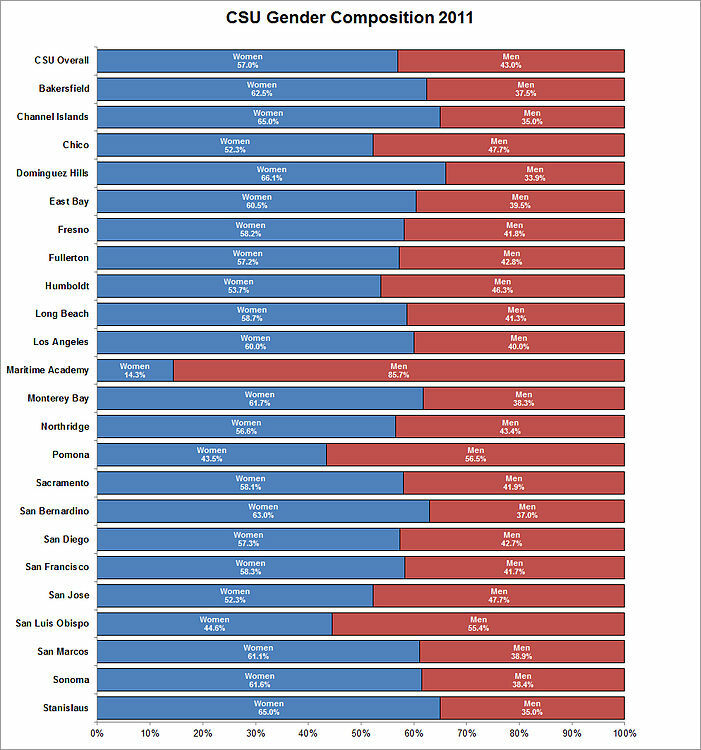 In addition, there is geographic preference given to those residing within the commuting areas of the colleges. ABET, Inc., (formerly the Accreditation Board for Engineering and Technology), accredits post-secondary degree programs in applied science, computing, engineering, and technology. It is intended to certify the quality of these programs. The California State University has 18 ABET-accredited engineering colleges throughout California. The CSU is a founding and charter member of CENIC, the Corporation for Education Network Initiatives in California, the nonprofit organization which provides extremely high-performance Internet-based networking to California's K–20 research and education community. ^ As of June 30, 2016. "2015–16 Philanthropic Support" (PDF). The California State University. p. 53. ^ As planned for 20171-8 "2017-18 Support Budget" (PDF). The California State University. p. 9. ^ a b "CSU Facts 2015". The California State University. ^ "The CSU 2018 Factbook" (PDF). The California State University. Retrieved 2018-08-23. ^ "CSU Facts 2017" (PDF). The California State University. ^ Home Page. California State University. Retrieved on December 6, 2008. ^ a b c d "CSU Media Center" (PDF). Calstate.edu. Retrieved 2016-12-04. ^ Systemwide Information | Measuring the Value of a CSU Education | CSU. Calstate.edu. Retrieved on 2013-07-15. ^ "Working for California: The Impact of the California State University System" (PDF). Office of the Chancellor. May 2010. Retrieved November 8, 2012. ^ The Colleges Where PhD's Get Their Start. The College Solution. Retrieved on 2013-07-15. ^ Graduation Facts | 100,000 Graduates Strong Archived June 29, 2014, at the Wayback Machine. Blogs.calstate.edu. Retrieved on 2013-07-15. ^ a b "Faculty and Staff Demographics | 2015 Facts About the CSU | PA | CSU". Calstate.edu. Retrieved 2015-10-21. ^ Gerth, Donald R. (2010). The People's University: A History of the California State University. Berkeley: Berkeley Public Policy Press. pp. 5–9. ISBN 9780877724353. ^ Gerth, Donald R. (2010). The People's University: A History of the California State University. Berkeley: Berkeley Public Policy Press. pp. 10–11. ISBN 9780877724353. ^ Gerth, Donald R. (2010). The People's University: A History of the California State University. Berkeley: Berkeley Public Policy Press. pp. 11–26. ISBN 9780877724353. ^ Gerth, Donald R. (2010). The People's University: A History of the California State University. Berkeley: Berkeley Public Policy Press. pp. 26–30. ISBN 9780877724353. ^ a b Gerth, Donald R. (2010). The People's University: A History of the California State University. Berkeley: Berkeley Public Policy Press. pp. 31–32. ISBN 9780877724353. ^ Kerr, Clark (2001). The Gold and the Blue: A Personal Memoir of the University of California, 1949–1967, Volume 1. Berkeley: University of California Press. pp. 176–177. ISBN 9780520223677. ^ a b c d e f Gerth, Donald R. (2010). The People's University: A History of the California State University. Berkeley: Berkeley Public Policy Press. pp. 23–24, 33–35. ISBN 9780877724353. ^ "The CSU Board of Trustees". The California State University. 2008-01-18. Retrieved 2008-01-18. ^ "The California State University Board of Trustees Almanac / Supplement, 1981-1988" (PDF). 1989. Archived from the original (PDF) on August 30, 2017. Retrieved May 18, 2018. ^ "Meet the Board of Trustees". www2.calstate.edu. Retrieved 8 January 2019. ^ Lovekin, Kris (October 4, 2012). "Timothy White to Leave UC Riverside to be Chancellor of 23-Campus California State University System". UCR Today. University of California, Riverside. Retrieved October 4, 2012. ^ "CA Codes (edc:89300-89304)". 2009-04-30. Archived from the original on April 30, 2009. Retrieved 2018-05-18. ^ "CA Codes (edc:89305-89307.4)". 2009-04-29. Archived from the original on April 29, 2009. Retrieved 2018-05-18. ^ a b c d e f g "Working for California: The Impact of the California State University System" (PDF). Calstate.edu. Retrieved 2016-12-04. ^ "CSU - AS - Statistical Reports". calstate.edu. ^ Monica Malhotra. "CSU | AS | Enrollment by Ethnic Group - Fall 2015". Calstate.edu. Retrieved 2018-03-25. ^ "CSU Employee Profile" (PDF). Calstate.edu. Retrieved 2016-12-04. ^ "race-to-the-bottom - California Faculty Association". Calfac.org. Retrieved 2015-10-21. ^ As of March 2, 2017. "U.S. and Canadian Institutions Listed by Fiscal Year (FY) 2017 Endowment Market Value and Change in Endowment Market Value from FY 2016 to FY 2017" (PDF). National Association of College and University Business Officers and Commonfund Institute. 2018. Archived from the original (PDF) on 2018-03-06. Retrieved 2018-03-02. ^ Regional University West Rankings | Top Regional Universities West | U.S. News Best Colleges. Colleges.usnews.rankingsandreviews.com. Retrieved on November 14, 2015. ^ "2018 Best Colleges in California - US News Rankings". usnews.com. ^ 2016 Master's Universities Rankings. Washington Monthly. Retrieved on February 10, 2017. ^ 2016 National Universities Rankings. Washington Monthly. Retrieved on February 10, 2017. ^ "2016 America's Top Colleges". Forbes. July 5, 2016. ^ Regional Colleges West Rankings | Top Regional Universities West | U.S. News Best Colleges. Colleges.usnews.rankingsandreviews.com. Retrieved on November 14, 2015. ^ CSU Stanislaus | Stockton Center. Stockton.csustan.edu. Retrieved on 2013-07-15. ^ "Desert Studies Center at Soda Springs". fullerton.edu. Archived from the original on 2006-03-15. ^ "Moss Landing Marine Labs". calstate.edu. ^ SAN BERNARDINO: Observatory to bring the universe to community | San Bernardino County News | PE.com - Press-Enterprise. PE.com. Retrieved on 2013-07-15. ^ "Southern California Marine Institute". scmi.net. Retrieved 2017-11-02. ^ "Training Ship Golden State". 2004-11-16. Archived from the original on 2004-11-16. Retrieved 2018-05-18. ^ "HSU Marine Lab". humboldt.edu. ^ "LSU Reservations". Archived from the original on October 26, 2014. ^ Smelser, Neil J. (2010). Reflections on the University of California: From the Free Speech Movement to the Global University. Berkeley: University of California Press. p. 186. ISBN 9780520946002. Retrieved 15 June 2015. ^ Renny, Christopher (2005). "New Working-class Studies in Higher Education". In Russo, John; Linkon, Sherry Lee (eds.). New Working-class Studies. Ithaca: Cornell University Press. pp. 209–219. ISBN 9780801489679. Retrieved 15 June 2015. ^ Berquist, William (2006). "Leadership at the Interest: New Forms of Governance to Oversee New Form of Higher Education". In Anderson, Walter Truett; Dator, James Allen; Tehranian, Majid (eds.). Learning to Seek: Globalization, Governance, And the Futures of Higher Education. Piscataway, NJ: Transaction Publishers. pp. 82–100. ISBN 9781412806152. Retrieved 15 June 2015. ^ Pickens, William H. (1999). "The California Experience: The Segmented Approach". In Gaither, Gerald H. (ed.). The Multicampus System: Perspectives on Practice and Prospects. Sterling, VA: Stylus Publishing, LLC. pp. 145–162. ISBN 9781579220167. Retrieved 15 June 2015. ^ Wallace, Amy (19 January 1997). "The CEO Higher Learning". Los Angeles Times Magazine. Tribune Publishing. Retrieved 15 June 2015. ^ Kevin Starr, Coast of Dreams: California on the Edge, 1990–2003 (New York: Alfred A. Knopf, 2004), 583. ISBN 9780307795267. ^ California State Department of Education (1960). A Master Plan for Higher Education in California: 1960–1975. Chapter IV - Students: The Problem of Numbers, p. 46. Retrieved: September 12, 2016. ^ "Page not found". Carnegie Foundation for the Advancement of Teaching. ^ "The University of California Statistical Summary Fall 2011" (PDF). Archived from the original (PDF) on 12 July 2012. Retrieved 23 October 2012. ^ Reed, Ann (Spring 2003). "Donald R. Gerth to leave the Sac State presidency after nearly two decades". Capital University Journal. Archived from the original on 2004-09-23. Retrieved May 18, 2018. ^ "The 2015–16 Budget: Higher Education Analysis". www.lao.ca.gov. Retrieved 2017-04-01. ^ Saavedra, Sherry (September 23, 2007). "As SDSU evolves, demand for housing grows; University was built as commuter campus". San Diego Union Tribune. Retrieved 2008-01-18. ^ "Cal State joins national trend to switch to 15-week semesters". EdSource. Retrieved 2018-05-18. ^ "Campus Impaction". The California State University. July 23, 2012. Retrieved December 4, 2016. ^ "Campus Names". calstate.edu. California State University. Retrieved 5 March 2013. ^ "California State University - Campus Websites". calstate.edu. ^ Gerth, Donald R.; James O. Haehn (1971). Invisible Giant: The California State Colleges. Jossey-Bass, San Francisco. ISBN 0-87589-110-1. ^ a b "CSU NEW STUDENTS (DUPLICATED) APPLICATIONS AND ADMISSIONS BY CAMPUS AND STUDENT LEVEL, FALL 2016". California State University. 24 June 2017. ^ "Impacted Undergraduate Majors and Campuses in the California State University – 2008–2009". The California State University. 2008-01-18. Retrieved 2008-01-18. ^ CSUMentor - Explore Campuses - Campus Facts - Cal Maritime. Csumentor.edu. Retrieved on 2013-07-21. ^ "California State University Agricultural Research Institute". calstate.edu. ^ "California State University Program for Education and Research in Biotechnology (CSUPERB) - CSU". calstate.edu. ^ "CSU Degree Programs". Hospitality Management Education Initiative. Retrieved 18 July 2012. ^ "Measuring the Value of CSU". California State University. Retrieved 18 July 2012. ^ "California Postsecondary Education Commission - Topical Listing". Cpec.ca.gov. Archived from the original on 2006-09-25. Retrieved 2016-12-04. ^ "California State University unveils 'radical' plan for online courses". timesheraldonline.com. ^ "California Pre-Doctoral Program - CSU". calstate.edu. ^ "Chancellor's Doctoral Incentive Program (CDIP) - Human Resources - CSU". calstate.edu. Archived from the original on 2006-09-06. ^ "California State University Program for Education and Research in Biotechnology (CSUPERB) - CSU" (PDF). csuchico.edu. Donald R. Gerth. The People's University: A History of the California State University. Berkeley: Institute of Governmental Studies, University of California, 2010. ISBN 978-0-87772-435-3.